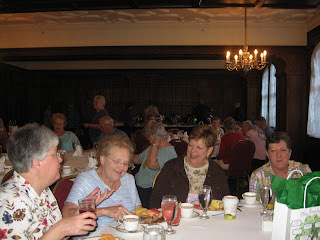 This is the tenth in the series on the Presidents of EWGS leading up to the 75th anniversary in 2010. See the previous posts on Samuel Pool Weaver, Leora Cookingham Thiel, Susan Marie West Jack, Ruth Churchill Austin, Alfred Denman, Florence Ballou Brown, Harriet Jefferson Pinkham, Mary Elizabeth Dow Maltbie and Achsah Maltbie Rawlings. Lee DeGolyer Patchen was the first EWGS President born in Spokane February 18, 1892 and he died November 23, 1970 at his home. He was cremated. He was a World War I veteran, having served in the Army Air Forces. 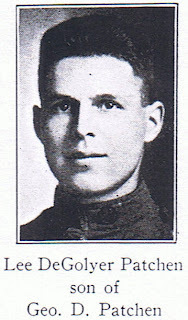 He was overseas from July 31, 1918 till December 2, 1918 and honorably discharged January 17, 1919 at Long Island, New York. Lee was married three times, the first to Nettie H. Clark who was 21 years old and from DesMoines, Iowa. They were married at Newport, Washington April 1, 1913. Nettie was the daughter of George W. Clark and Nora Kelly. I found no further information on Nettie. 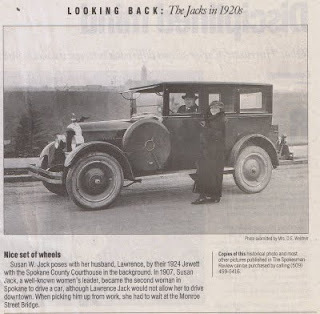 His second marriage was to Mary Louise Miller at Ellensburg, Washington February 6, 1919. Mary was born at Vinton, Iowa November 8, 1891 and died of myocarditis in Spokane November 24, 1945 and is buried at Greenwood Cemetery. Mary was the daughter of Clarence Eason Miller (b. Pacwaukee, Wisconsin April 8, 1866 d. Seattle, Washington February 22, 1939) and Ella May (Boyden) Miller (b. Eden, Benton Coounty, Iowa January 6 1868, d. Ellensburg, Washington May 6, 1918). Mary and Lee had two children both born in Spokane, Lee Harold Patchen b. April 5, 1921 and Mary Louise Patchin b. October 21, 1923. In 1957 Lee married Ruth Marie Vibrans. Ruth was born in Colville Washington in 1918. 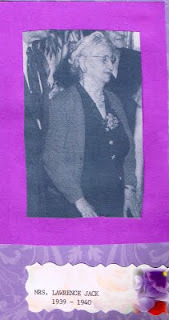 She was a secretary and had been Northwest director of National Association of Secretaries in 1969 and 1970. Ruth died October 2, 1991 at St. Lukes Extended Care Center. Lee worked as a carpenter for the Northern Pacific Railroad from 1912-1915. 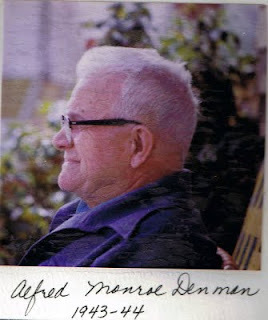 From 1915-1943 he worked for the Exchange Lumber & Manufacturing Company as a salesman and sales manager. From 1943-1947 worked as Assistant manager of Western Pine Manufacturing Company. Lee also owned the Lee D. Patchen Lumber Wholesale firm for 40 years. Lee's emigrant ancestor, Joseph Patchen came from England to New England in 1634. His mothers Olmsted family came from Canada after the War of 1812. Mary's Miller family came from Coleraine, Ireland. Jonathan Edwards in 1900. There were about 8,500 names in this book. He also indexed the "History of the Big Bend Country" published 1904 and it had more than 18,000 names. Note on indexing in 1948: This was well before computers that just allow us to type in a list of names and hit sort and we have an index. In 1948 you used index cards and typed the name at the top and maybe a couple of more lines of interest on the name. 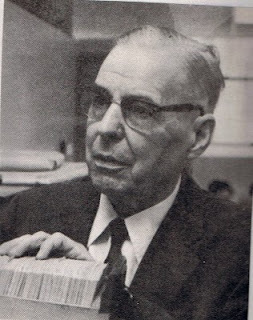 So now he has 26,000 index cards and that is the start of the "Patchen File" that anyone that has researched in the genealogy section of the Spokane library is probably familiar with. Lee went on to index several other books also. I am not sure when he started cutting out obits, pasting them on a card and typing the name and dates for each obit. For a while he also made a card for all the people listed in the obit. While you can find obits back to the 1920s the majority of obits start in the mid 1950s and at the end of 1979. The cards in the "Patchen File" number about 211,000. From 1980 to 1994 EWGS indexed obits in book form not by index cards. Comments by Carrie Lartigue: "Lee D. Patchen: Anyone that has used the Genie Room of the library should be familiar with this man's work! He spent days, then years, working on his index. He started the Tombstone project by copying nearly all the Rural Spokane County Cemeteries and made three volumes of this task. In early years he was called upon at least once a year to instruct the new members on how best to get started in research. 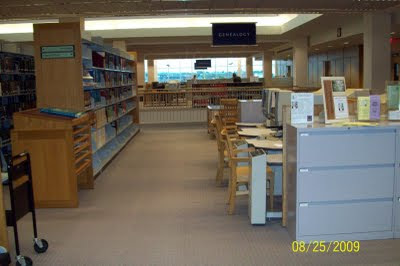 He authored several books... Inland Empire Miscellaney and the fantastic Patchen/Patchin Genealogy." Comments by the editor: In doing these articles I have relied a lot on the work of Lee Patchen. Eastern Washington Genealogical Society is proud to announce the addition of the New England Historical Genealogical Society to the list of available online databases. This database covers much of the northeastern United States, with heavy emphasis on Massachusetts and Rhode Island. As of right now, the records in Massachusetts are complete to 1910 and they are daily adding records to 1915. 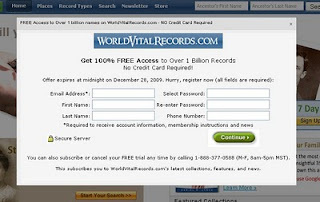 If you are new to the site I would recommend checking out Getting Started . This resource is only available in the Spokane library buildings, but could be the breakthrough you need to move further back in your family’s history. So check it out and let EWGS know what you think! 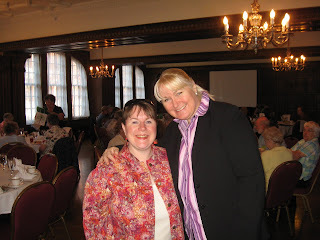 This is the ninth in the series on the Presidents of EWGS leading up to the 75th anniversary in 2010. See the previous posts on Samuel Pool Weaver, Leora Cookingham Thiel, Susan Marie West Jack, Ruth Churchill Austin, Alfred Denman, Florence Ballou Brown, Harriet Jefferson Pinkham and Mary Elizabeth Dow Maltbie. Achsah Adele Maltbie was the eldest daughter of Albert Lyman Maltbie and Mary Elizabeth Dow (from the previous post). She was born at Larine, Lincoln County Washington October 9, 1888. Larine is now Davenport. Achsah married Milton Granger Rawlings at their home in Seattle October 9, 1911. Milton was the son of Harvey Hazelrigg Rawlings and Carrie S. Wright. Achsah was the grandaughter of James Downing Maltbie (1832-1891) and Achsah Wright (b.1843). Achsah graduated from Waterville High School in 1906 and then went to the University of Washington and got her B.A. there in 1910. Professor Edmond Meany encouraged her interest in History. In 1920 Milton and Achsah came to the Spokane Valley. They farmed in the Saltese area and in 1923 moved to Dishman. Milton died in 1970 and is buried in Pines Cemetery. She was a founder of the Spokane Valley Women's Club, the last surviving charter member. She helped her mother found the Eastern Washington Genealogical Society. 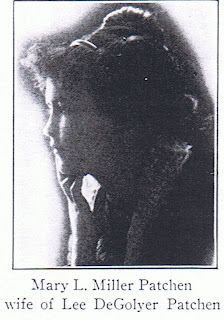 She joined the Esther Reed Chapter of the DAR in 1928. Served as chapter regent in 1939-40. She was also a 77-year member of the Eastern Star. 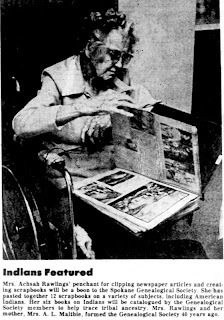 The Spokane Indian Tribe honored her in 1982 for the gift of a collection of newspaper articles on the history of the tribe. Her hobbies were collecting buttons and scrapbooking. She did five Lincoln scrapbooks, 14 Indian Scrapbooks, and pioneer scrapbooks. For the DAR she did Volume 2 of Genealogical Gleanings and Volumes 6 and 7 of the Families of Washington Pioneers. She subscribed for many years to the Boston Transcript and the Hartford Times and saved huge boxes of clippings from their query sections. Those queries were answered with sources by the genealogical researcher for those newspapers, so if you had New England ancestors your ancestor was probably listed in one of those articles. For EWGS she served as director for eight years, three years 2nd vice president, two years first vice president, and two years president (1949-1950). Achsah died January 27, 1984 and is buried in Pines Cemetery. Comments by Carrie Lartigue: Achsah, daughter of the founder Mrs. Maltbie: "Also a charter member and staunch supporter of historic preservation - whether on paper or in old buildings. She was a working member of several organizations but never neglected her interest in genealogy. She was a Lincoln Scholar and vastly interested in Native Americans. She made up fourteen scrapbooks of clippings on articles about Indians (indexed by Carrie Lartigue). These were presented to the Spokane Tribe and are in their library in the Tribal Council Center at Wellpinit, Washington." 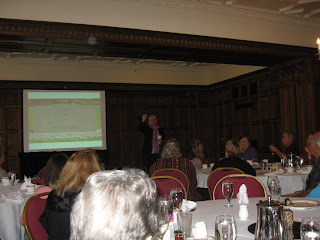 Editor Note: I was loaned three scrapbooks on EWGS by Lola McCreary (Thanks, Lola!) dating back to the beginnings of EWGS, and a lot of very interesting articles in it. After researching Achsah I believe she was responsible for these scrapbooks. I lived for five years in Colville, when I first moved to Washington State, and the newspaper now is called the Statesman-Examiner, after an obvious merge. I'm excited to see this collection, as I have an ancestor's brother that lived in this county in the early part of the 20th century, as well as a niece whose birth father's ancestors were pioneers in the area.If you have Washington State ancestors, you'll definitely want to check out these FREE resources! 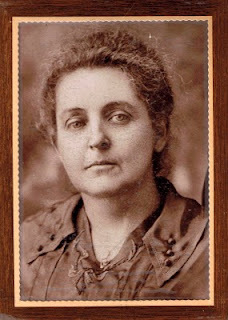 This is the eighth in the series on the Presidents of EWGS leading up to the 75th anniversary in 2010. See the previous post on Samuel Pool Weaver, the previous post on Leora Cookingham Thiel, the previous post on Susan Marie West Jack, the previous post on Ruth Churchill Austin, the previous post on Alfred Denman, the previous post on Florence Ballou Brown and Harriet Jefferson Pinkham. The next EWGS President was Achsah A. Maltbie Rawlings, but I think I will do this post on her mother Mary Elizabeth Dow Maltbie. Libbie was the actual founder of EWGS and while she served for five years as a Director of EWGS, she never was president of EWGS. She was the daughter of Joseph Godfrey Dow and Mary Ann Crouch. Joseph was born near Hampton, New Hampshire and moved to near Healsburg, California and that is where Libbie was born in 1868. Mary Ann Crouch came from Crawfordville, Illinois in 1848 by ox team at age 17 with her parents Mr. & Mrs. Edward Crouch. Joseph and Mary Ann married at Sonoma, in Sonoma county, California April 20, 1850. Her father Edward was killed near Kansas City Missouri during the Civil War by guerillas. Mary Ann Dow died June 9, 1927 in Spokane and is buried in Fairmunt Cemetery next to her husband Joseph Dow who died in Larene, Lincoln County, Washington and was first buried in Cannon Hill cemetery and then moved to Fairmount cemetery. The Maltbie family has been traced back to 1450 in England, William Maltbie came to the USA in 1672 and settled in Connecticut. Noah Maltbie was in the Revolutionary War. Three more generations and James Maltbie was in the Civil War. James had three sons Appleton, Pierce and Albert. In 1886 Pierce and Albert bought $5 tickets to San Francisco on the Union Pacific Railroad then took a steamer to Portland and a train to Walla Walla Washington, then to Spokane where they joined their father and other brother and then to Douglas county about 3 miles from Waterville. In 1887 Libbie Dow married Albert Maltbie at Sprague, Lincoln County, Washington and their first child Achsah was born at Larene, in Lincoln County in 1888 and their second daughter Theodora was born in Waterville in 1890. Appleton became the county clerk, Pierce was elected Marshall, and served in the Spanish American War. Albert Maltbie died in Seattle August 12, 1927 and Mary Elizabeth Maltbie died in Dishman September 26, 1945. The following resolution was passed by the Society on Saturday October 6, 1945 after the death of Elizabeth Dow Maltbie, one of the society's founders. Whereas, Our Heavenly Father, in his Infinite Wisdom, has removed from our midst our beloved member, the founder of this Society, Mrs. Elizabeth Dow Maltbie, be it Resolved, That this Society has suffered a great loss in the passing of Mrs Maltbie, whose keen interest in genealogical and historical research motivated her to call together on January 31, 1935, a group of persons similarly interested, resulting in the founding of this Society, ---and Resolved, That her counsel will be missed, and that her cheerfulness and perseverance under difficulties will be remembered by her fellow members, encouraging them to maintain the Society until her dream of a large and interested membership is realized, ---and Resolved, That a copy of this resolution will be sent to her daughter, Mrs. M. G. Rawlings, that she may know of the love and admiration in which the Society held Mrs. Maltbie, and that a copy be spread upon the minutes. 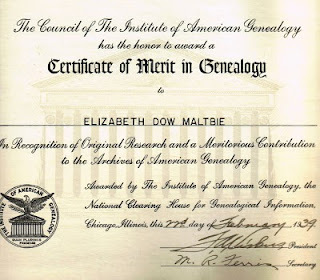 This is a certificate from the Council of the Institute of American Genealogy to Elizabeth Dow Maltbie. The Spokane Area Legacy Users Group Meeting originally scheduled for next Wednesday, December 16th has been CANCELLED due to group leader Donna Potter Phillips being engaged at the Salt Lake City Christmas Tour and with the business of the holidays. The next meeting will be Wednesday, January 13th. Stay tuned for more details. This is the seventh in the series on the Presidents of EWGS leading up to the 75th anniversary in 2010. See the previous post on Samuel Pool Weaver, the previous post on Leora Cookingham Thiel, the previous post on Susan Marie West Jack, the previous post on Ruth Churchill Austin, the previous post on Alfred Denman and the previous post on Florence Ballou Brown. 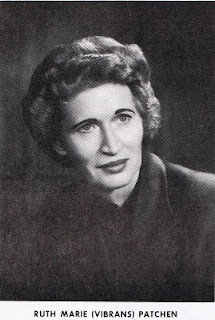 Harriet Jefferson Pinkham was EWGS President in 1947 and 1948 and she made tremendous contributions of materials to the genealogical section of the Spokane Public Library. Harriet Ann Jefferson was born June 27, 1861 the first white child in Duluth, Minnesota to Robert Emmet Jefferson b. May 9, 1836 in Naperville, Illinois, son of Robert H. Jefferson and Cornelia Peters, grandson of Ichabod and Betsy Jefferson of Winsor County, Vermont, and great grandson of Daniel Jeppson of Glasgow, Scotland. Her mother was Lucy A. Sowles of Ohio, granddaughter of Lemuel and Catherine (Didrick) Sowles. Harriet's father died in the Civil War. She graduated from the University of Minnesota and came west to Washington in 1888 on an immigrant train with her husband Louis Hampden Pinkham. They had two children Louis H. Jr. b. Octtober 11, 1888 and he died a Lieutenant in Army of occupation in Coblentz, Germany February 5, 1919, and Cornelia Ann b. May 31, 1890 and d. March 18, 1916. Both of the children are buried in Portland Oregon. Louis Pinkham died August 12, 1938 at Route 5 Spokane. he was a retired salesman and a member of the Gold Star Parents, and his body was buried in Portland also. 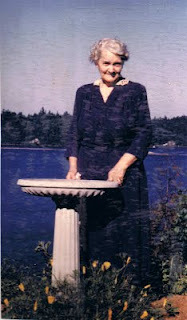 Harriet Pinkham died December 17, 1956 here in Spokane and was cremated. She was survived by two grandsons and cousin Rhoda Jefferson. 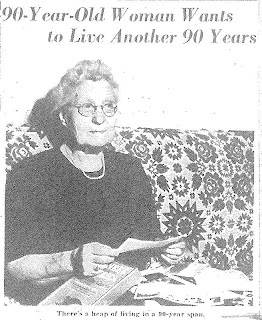 She was one of the founding members of EWGS, the oldest member of Delta Gamma (University of Minnesota), member of Esther Reed chapter DAR, Eastern Washington State Historical Society and the Manito Study club. She authored volumes 8 and 9 of the DAR Pioneers of Washington series of books. Comments by Carrie Lartigue: "I remember her as a tiny little lady of ninety seven years. She and her niece Rhoda Jefferson, attended a meeting the day I joined. I never forgot Mrs. Pinkham's story.. what an inspiration to a beginner!! 'I was reading a book recently, of the life of Thomas Jefferson, when he lived at Monticello. One picture was of the drawing room. It was furnished with a diamond tufted red velvet love seat and chairs. They looked vaguely familiar to me, I knew I had seen them before. Later, I took the book back into my front room... and there was the same love seat and chair! We were so astonished! Rhoda helped me turn the chair upside down, and there stamped on the wood frame was a single word: Monticello.'" This is the sixth in the series on the Presidents of EWGS leading up to the 75th anniversary in 2010. See the previous post on Samuel Pool Weaver, the previous post on Leora Cookingham Thiel, the previous post on Susan Marie West Jack, the previous post on Ruth Churchill Austin and the previous post on Alfred Denman. Florence Ballou Brown was the seventh EWGS President in 1946. She was born in Milton, Oregon October 22, 1880 and Died in Walla Walla March 25, 1964. She was the 8th child of Orlando R. Ballou b. Cayahoga Falls, Ohio 12-19-1833 d. Freewater, Oregon 7-14-1909 and buried at Walla Walla, Washington, and Elizabeth Boyd b. 5-12-1837 in Watertown, New York. She was the daughter of John Boyd b. 8-4-1794 Belfast, County Antrim Ireland d. 1853 Breckville, Ohio and Eliza Saylor b. 4-5-1801 Philadelphia, Pennsylvania and d. 2-27-1900 Breckville Ohio. Florence married in Walla Walla, 9-30-1903 David Brown born Galena, Illinois 12-5-1865, they had three children Helen Elizabeth, Gordon Ballou, and Sylvia Naudain Brown. David was the son of Sherwood S. and Cecelia (Bouton) Brown. Sherwood ran Hazelwood Farms in Illinois, and when David and his brother George Brown came to Spokane in 1888 they formed Hazelwood Farms near the Hayford-Cheney road and the Sunset Highway. Mr. Brown was the president of the company for more than 30 years. He also founded Spokane's National Apple Show. In the early 1900s Hazelwood Farms was the second largest dairy in the country, they first innovated wrapped butter, pasteurized cream, baby formula and an extensive program to encourage sanitary dairy practices. The dairy cattle specially bred became the core of the Carnation Milk Company's world famous Holstein herd in Seattle. Florence was also a member of the Spokane Gary Chapter of the DAR and authored the Volumes 10 and 11 of the Washington Pioneer Series the DAR did in the 1930s. After David died in December 1951 Florence moved to Milton Freewater, Oregon. Florence was also listed in the Who's Who in Genealogy 1937 by the American Handbook of Genealogy. I read the listing and it looks to me more like a place to post queries than an honor for being a famous genealogist.